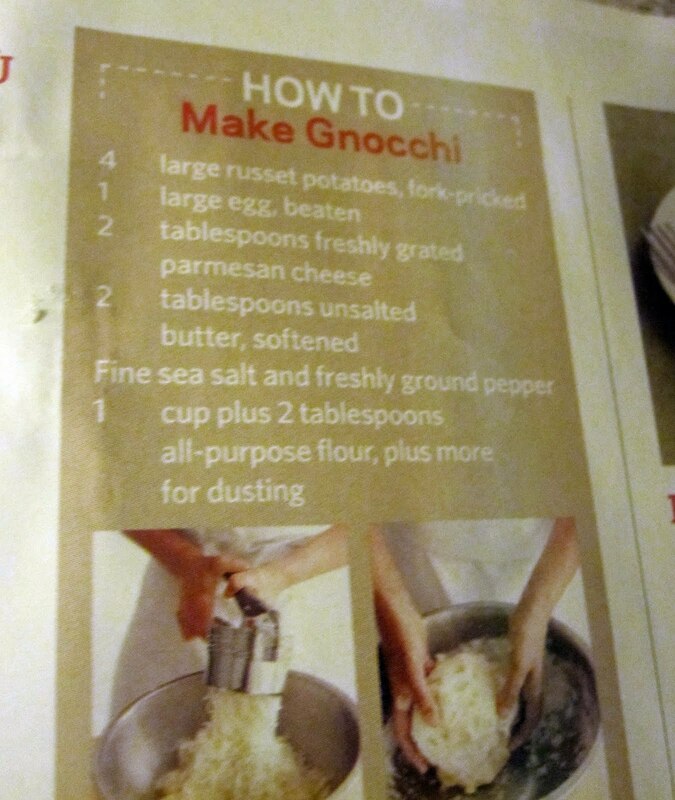 After perusing every gnocchi recipe on the web, one day I opened up my Food Network magazine and here it was. 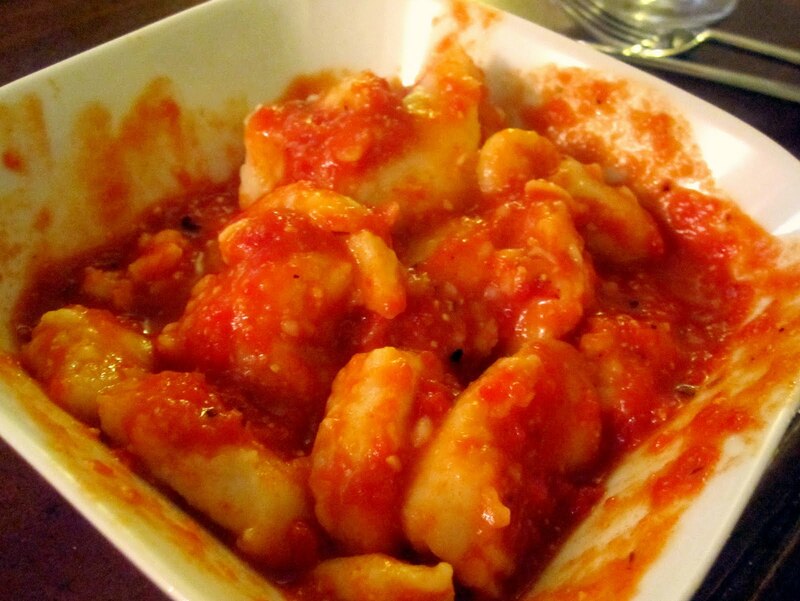 The easiest gnocchi recipe I had ever seen. Next bake your potatoes for an hour. 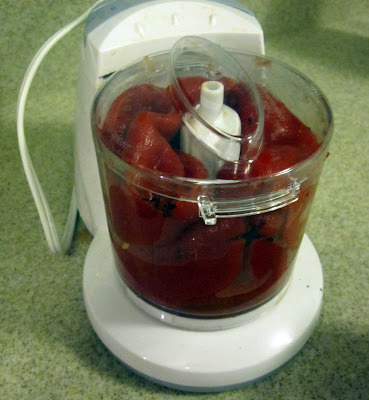 Once cooled, scoop out the flesh. (I hate when recipes refer to food as flesh...ummm I don't want to eat something called flesh.) Put the "flesh" in your potato ricer and you will have a pile of this. 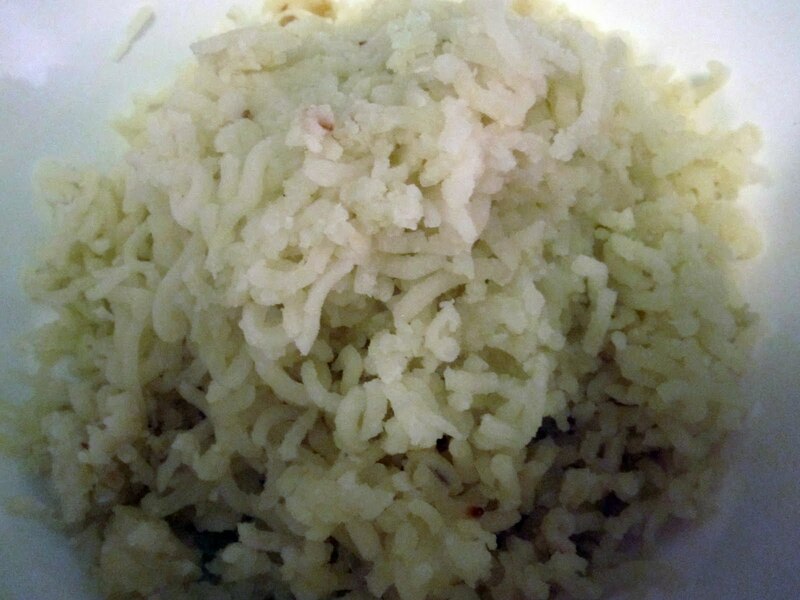 It looks like rice. Hence, a potato "ricer." The next step is important and confusing all at the same time. It seems simple enough: Add flour to the dough. Continue to add flour until the dough becomes less sticky. Here's the confusing part: Some recipes call for kneading and some say not to. All the recipes say to make sure you don't add too much flour or the dough will get heavy. Heavy dough is the death of gnocchi. 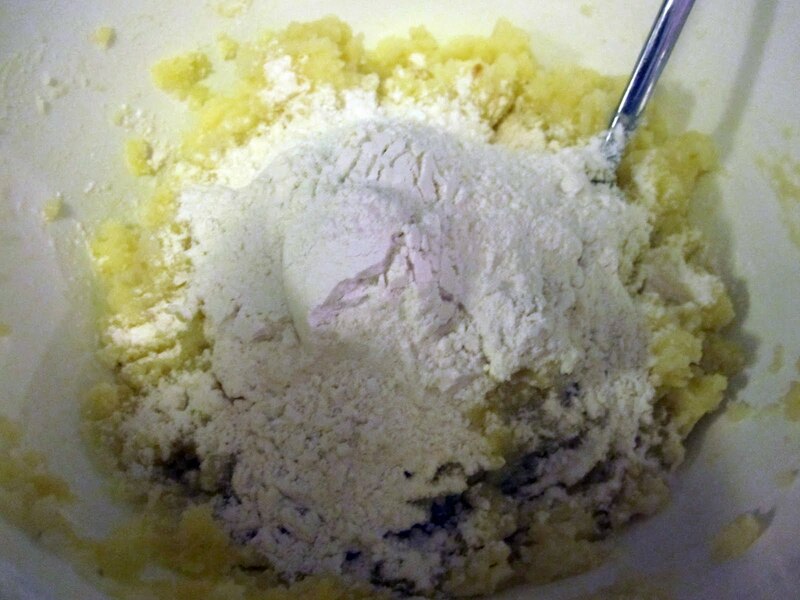 You have to add exactly the right amount of flour to make sure the dough doesn't stick, but not too much or the dough will be heavy. It's impossible I say. To knead or not to knead? To flour or not to flour? What's a girl to do? The next part of the process is really fun but super time consuming. 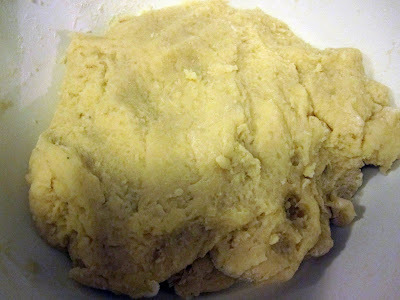 Separate the dough into eight pieces and roll it into skinny logs of dough. Skinnier than what I did below. After reading more about the process, I am realizing the gnocchis should be smaller. 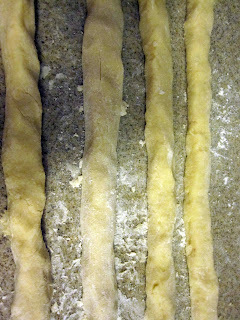 Anyways, after you roll them out (just use your hands and me sure to flour the surface really well), cut into pieces. 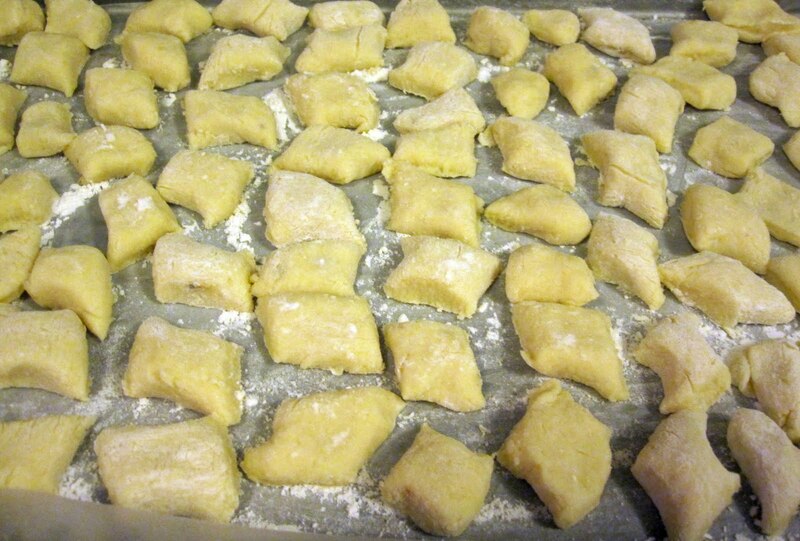 Lay the gnocchi flat on a baking sheet and stick in the freezer until ready to cook. I put wax paper down and floured the wax paper to make sure the gnocchis didn't stick. Don't layer on top of each other, they will clump together. 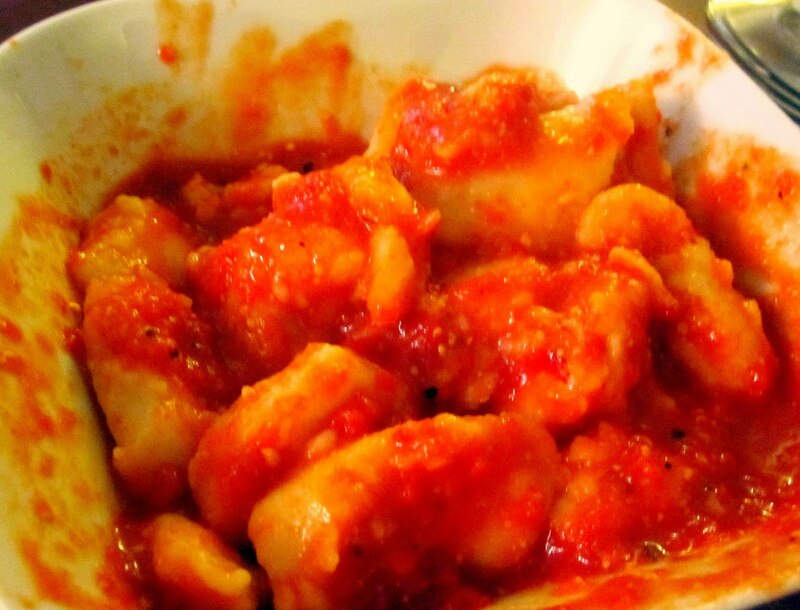 Paired with the gnocchi, I made a roasted red pepper sauce. This was actually really, really yummy. I got the recipe from Epicurious, but modified it by adding some regular tomato sauce to balance out the sweetness of the roasted red pepper. Be careful with the Parmesan. I tried to put in a little bit and ended up pouring in half the container. Yikes! 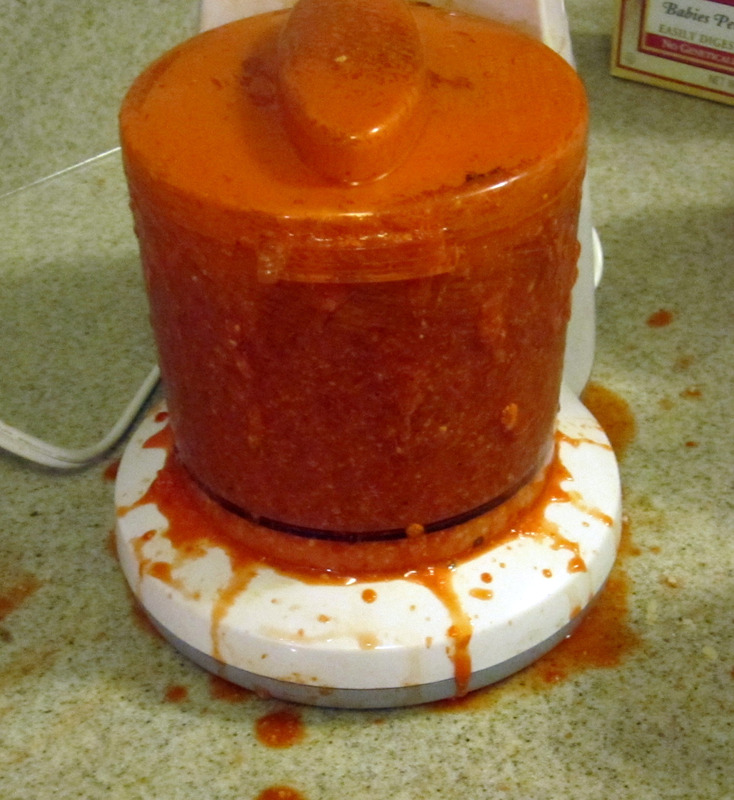 Should have called it Parmesan Roasted Red Pepper Sauce. When you stuff everything in, it will overflow, like so. And this orangey red color dyes your counter top quite nicely. So that's fun to clean up. I personally enjoy breaking a sweat while cleaning up after dinner, but maybe you don't. It looks pretty tasty, doesn't it? And it was. The sauce was perfection; I suggest making it (without a tub of Parmesan!). It was the gnocchi that were ... simply adequate. While they were cooking, they didn't completely fall apart, but some of the gnocchi didn't stay quite together. I suffered the curse of most first time gnocchi makers - they were heavy and potato-ey. 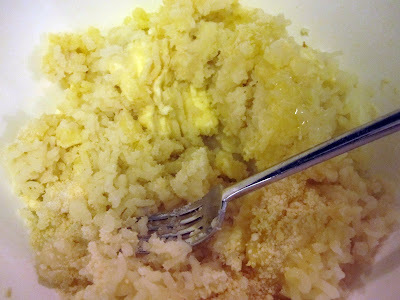 Sort of like I accidentally made the dumplings that go with chicken n' dumplins as opposed to Italian potato dumplings. Still delicious, but not light and airy as I had hoped. So, what was the culprit? It could be many things ... the flour content, the size of the gnocchi, the cooking time, I can't be sure. I assume like most things it just takes practice. Food Network recipe from Anne Burrell - she talks about refrigerating the dough before cutting it. Does anyone have any gnocchi tips or a good recipe? Please share and help me conquer this mysterious beast. the blender explosion made me laugh out loud, or "lol" for short. I am going to get my mom's gnocchi's recipe for you. She makes the best I've ever had. 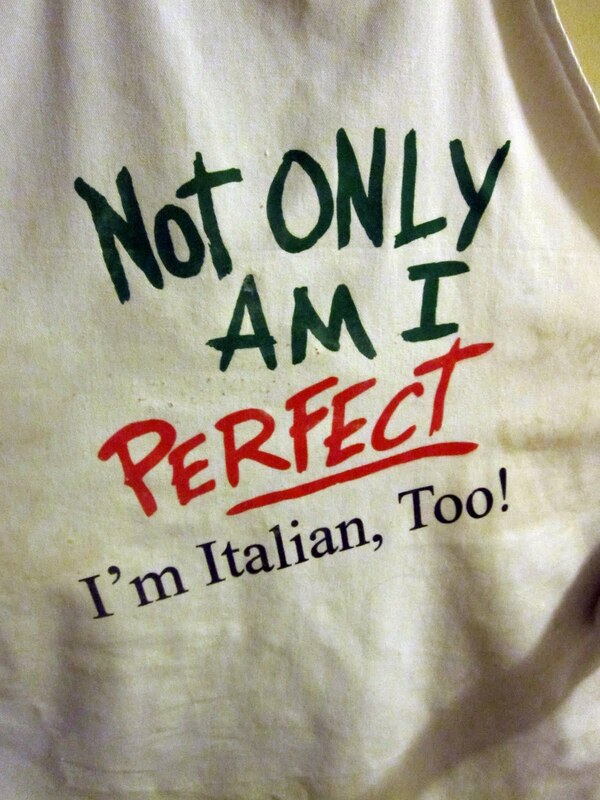 And I've eaten A LOT of gnocchi's. Its what I always ask for on my birthday. Great (and funny) post! Love the apron. I could eat bowl after bowl of gnocchi, but have never tried to make it myself. I'm a wuss. HA! I too made this recipe from my magazine! It was fun, but made too much! now following, found you through the rosebud network!